Studying has never really come naturally to me. Up until my sophomore year in high school, I had such a hard time prepping for tests or even just doing simple assignments that required looking back at my notes. I had no trick for retaining information, and my poor penmanship made me spend more time making sure my notes were readable, rather than paying attention to what the teacher was saying. Eventually, I took a note-taking class. I’m still not the best note-taker in the world, but what I’m about to list has helped me improve tenfold and may be useful for anyone who is having some difficulty like I was. 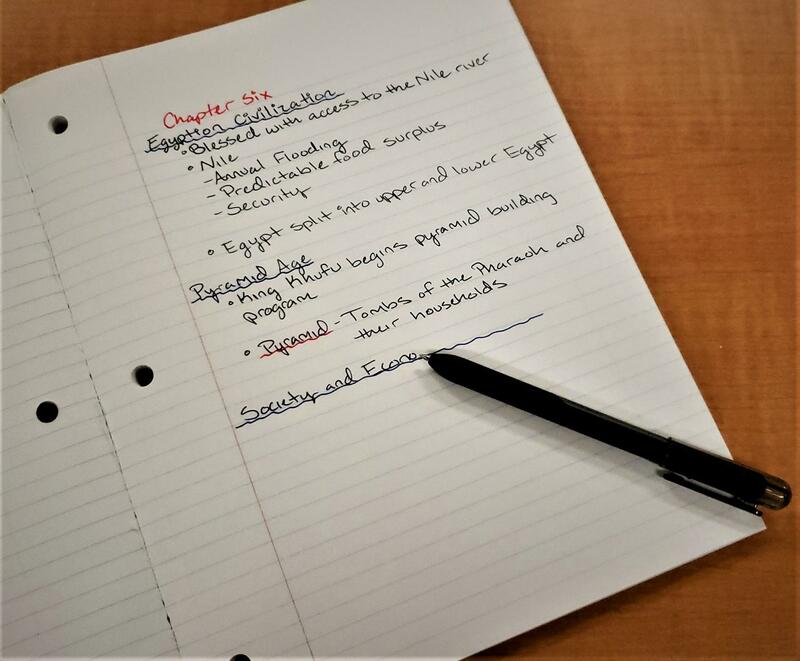 The first thing I learned was how to speed up, and clean up, my note-taking. I found that paraphrasing the bigger words and removing unnecessary filler helped me keep up with my teachers. A recent example of this would be last week when my science professor wrote: “Intrusive igneous bodies are generally classified according to their shape as either tubular or massive”. Instead, in my notes, I wrote: “Intrusive bodies classified as tubular or massive”. On top of that, underlining or circling important information that may be on future tests is really useful when studying at home. I usually use a red pen because it stands out and is easier to find. But even though I can read the notes I take, the information is worthless if I don’t organize my work. Every other day or so, I sit down and map out all my new assignments. Using a checklist, I write down and keep track of what I need to do. Checking things off is incredibly motivating and keeps me from becoming overwhelmed. I make it a point to put minor goals on my list so that I feel confident in what I’ve accomplished, instead of hopelessly working all night to push past one big, vague hurdle like “science”. I also make sure everything I need for studying is put together beforehand. If I am studying for a quiz that is a week away, I will frequently refer back to my notes for the chapter or any previous assignments. So it is important that I have all my notes organized and ready before I start studying. However, what’s most important is keeping my mind focused. According to the American Psychological Association, between 80 and 95 percent of college students procrastinate on their schoolwork. Unfortunately for me, procrastination happens all the time. One minute, I’ll be working hard on an assignment, and the next, I’ll be watching a video or texting my friends. It’s a really bad habit that I have trouble shaking, but to keep myself on track, I prioritize my study schedule and how I study. Prioritizing is really easy. On my phone, I always set reminders to study about a half-hour or so after I get home from my classes. Any time can be set, but a half-hour works for me because it allows me to relax and rest for a little while so I don’t get burned out later. In addition to Professor Bretz’s recommendation, I’ve found that repetition is key when I am studying. Writing down definitions or facts over and over again helps cement that information into my brain so that even if I blank in the middle of a test, the answers will eventually come to me. In my note-taking class, I was taught that writing on paper while studying is the best way to retain the information I need, and so far it hasn’t failed me. I also make sure that I take breaks while I work. I don’t like to take several long breaks because of how easily I get sidetracked, so I usually only give myself two to three 10-minute breaks in order to stay focused. Re-hydrating and walking around also helps me clear my head if I’m getting frustrated with an assignment. This is all information that I have found useful, especially in my college classes. If there is anyone who is still struggling like I was, I recommend either giving what I’ve done a try or visit the tutoring center. They have unlimited free sessions where you can just drop in anytime. a）（3）The first thing that I learned is how to make and clear my notes.Changing some words and delate some unnessary is a useful method.One example is in science class. （4）There are also have some vital thing is highlight and mark some important points，red pen is a good choice.Organizing them is vital event.Because of without it，it has no value. The author mentioned that keep the attention and manage yourself is the key for successed.